nose: Bold and rich sherry flavours, not sweet but rather dry sherry, along with maraschino cherries and lots of herbs. It's like cough syrup covered by gentle peat and smoke. A whiff of adhesive tape, menthol and gunpowder is coming through, complemented by polished furniture and dark rotten wood. Very interesting, the kind of profile that keeps you nosing all night long. Palate: The sweetness is rather discreet at first with lots of old and dry sherry, herbal lemonade and Christmas spices. Cloves, anise, cinnamon, cardamom and pepper emerge along with a warm sweetness, plum jam and acacia honey. Excellent mouth feel with slightly bitter oak and gentle smoke in the end. Finish: The finish is long and sweet with dark fruit, sherry and lots of herbs. Slightly astringent in the end with prickling oak spice, dry tannins, black pepper and a touch of cold smoke. With water: Almost no change on the nose with more sherry and plums on the palate, fruit and lots of lingering winterly spices. The finish still is long, sweet and warm with a huge amount of delicate herbs. Comments: A superb whisky! Rich flavours, slightly coastal aroma with big cask influence. The wrestling match between distillery character and Pedro Ximinez sherry cask is clearly won by the oak. 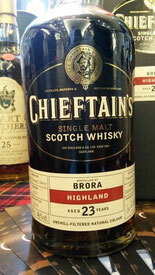 Maybe nothing for the real Brora aficionado but certainly one for the dark winter days.